Taking a stand. Stars including Jesse Tyler Ferguson and La Toya Jackson took to social media to praise Kesha following her powerful performance of “Praying” at the Grammy Awards 2018 on Sunday, January 28. Janelle Monae introduced the performance with an empowering speech about the Time’s Up movement, which helps provide legal aid for victims of sexual assault, harassment and inequality in the workplace. 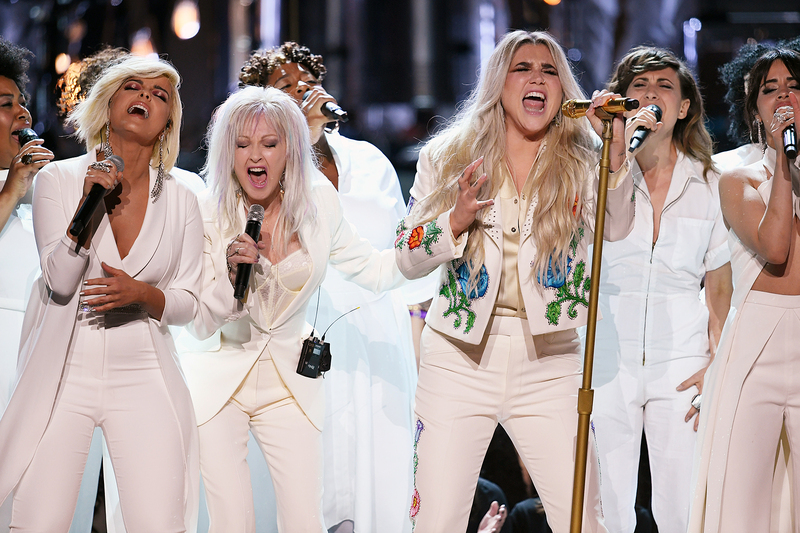 Kesha, 30, then took the stage and was joined by Camila Cabello, Cyndi Lauper, Andra Day and Julia Michaels along with a larger chorus. At the end of the performance, Kesha was seen crying as she hugged the fellow performers. Kesha took to Twitter before the show to open up about creating the song and its importance. As previously reported, Kesha was involved in a legal battle with producer Dr. Luke. In 2014, she filed a lawsuit claiming that he was verbally and sexually abusive toward her, which he has denied. Kesha later dropped the lawsuit against him in August 2016 in order to focus on releasing new music. All the women backing up my girl @KeshaRose makes me SO EMOTIONAL.